With aluminium windows and doors growing popularity, Titon is experiencing significant demand for hardware in this sector. The company has a huge range of products designed specifically for aluminium, many of which originate from Sobinco. 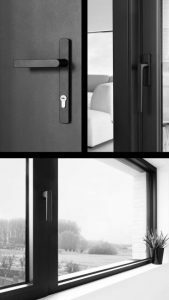 Titon has been the exclusive UK distributor for Sobinco for nearly 40 years, supplying hardware such as tilt and turn window systems, pivots, catches and handles, as well as locks, lift-slide systems, roller assemblies and handles for doors. Commenting on the relationship with Sobinco, Julian Wiseman, Sales Director (Aluminium) at Titon, said: “Our relationship with Sobinco has strengthened significantly over the years. From humble beginnings with just a small group of products, we now have an enormous portfolio available. He continued: “The products from Sobinco are extremely flexible and can be produced in more than 450 colours to make a project truly unique; alternatively, there is the ever-popular anthracite grey to complement the latest ‘designer’ bi-fold doors. We are also able to turn orders around quickly, as Sobinco is extremely self-sufficient, with everything from R&D and castings, to pressings and painting, all taking place in-house. Titon has seen a year-on-year increase in sales of aluminium hardware which, in addition to the Sobinco range, also includes the company’s own handles, espags, hinges and trickle ventilators, as well as options from other manufacturers. Additionally, Titon also provides its customers with full technical advice and support, to ensure all products perform reliably and effectively.